This was a farm share project but not a canning project. In the final farm share we received Concord Grapes. We all love the taste, but no one really wants to fuss with the seeds. So I thought about making juice. When I ordered the Clearjel online I thought that maybe I should order a few other things since I had to pay for shipping anyway. So I chose a jelly bag, which arrived today, and I got to testing it out. Suffice to say, it's messy. I need something with higher sides to catch the juice. I ended up clipping waxed paper to the ring at the top to serve as a splash guard. 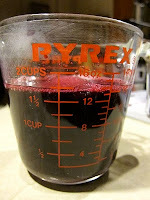 Ultimately, I extracted 1.5 cups of juice from approximately 1 pound of grapes. To this I added about a half cup of sugar and it's in the fridge, waiting for breakfast. OMG it was so goooood!